Crises of delegation confront those at the top of hierarchies when their authority fails to be recognised by their followers i.e. when power-at-the-centre fails to command obedience. How are we to think about these crises? In what follows, it is proposed that crises of delegation arise when the complex overwhelms the complicated. In the simple system, cause-and-effect relations are repeatable, perceivable and predictable. Everyone knows the right answers that are easily provided by the leadership. In the complicated system of systems, cause-and-effect relations are not so easy to predict because they are spread over time and space. Nevertheless numbers of experts can be expected to provide the right answers in support of the leadership. The complex ecosystem emerges when cause-and-effect relations become apparent only in retrospect, and cannot be assumed to repeat. This happens when the sheer weight and circularity of cause-and-effect relations become overwhelming (corresponding to the turbulent fields of Emery and Trist). 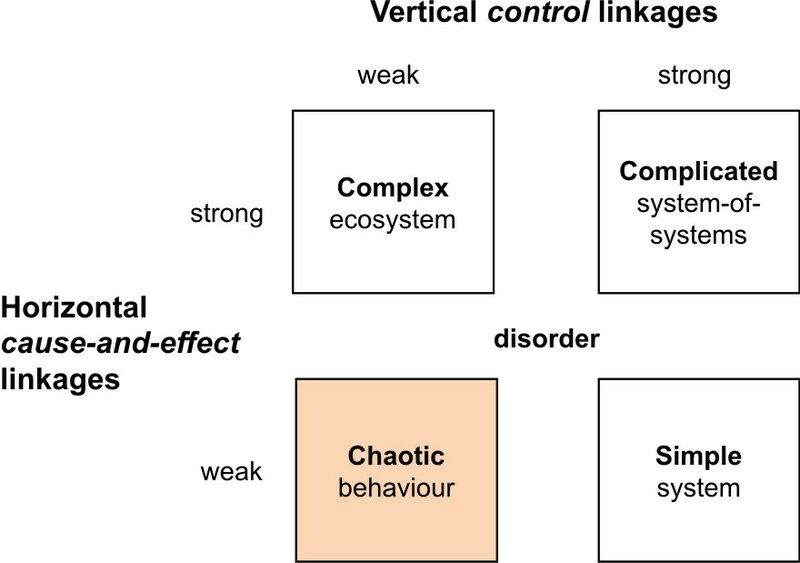 In this environment, the particular characteristics of the situation become crucial, and vertical control linkages become weak because right answers can only emerge retrospectively – not a good basis for central authority. This environment is described as an ecosystem because fromm the perspective of the situation, multiple separate institutions become involved, the individual having to work in relation to many different authorities, each spanning different areas of local control. Finally, behavior becomes chaotic when no cause-and-effect relations are perceivable, even in retrospect. In this environment there are no right answers and everyone is in trouble knowing what to do. While power-at-the-centre describes the exercise of strong vertical control linkages by leadership (North-South dominance as distinct from East-West dominance), power-at-the-edge (i.e. being edge-driven) describes the necessary approach to leadership in a complex ecosystem in which those closest to a situation need to be authorised if they are to be effective. What, then, are the drivers of organisational scope? Any institution is going to face a gradual increase over time in the complexity of its environment, and therefore a demand for increasingly differentiated behaviors. We may therefore expect a progression in any institution from the simple to the complicated. The crisis of delegation arises when the complex nature of the ecosystem overwhelms the complicated basis of the institution’s existing authority, demanding the removal of its ‘strategy ceiling‘ so that it can make a transition to the relational form of organisation. The drivers of organisational scope are therefore the capacity of the institution to manage the complicated, set against the complexity of the cause-and-effect relations to which it is having to respond. Looked at like this, any institution is in a governance cycle through which it can learn how to respond to increasingly asymmetric demands. Or not. The argument I made in The Twitter Revolution: how the internet has changed us is that just as the Printing Revolution precipitated the crisis on delegation associated with the Reformation, so too is the Information Revolution precipitating a crisis of delegation in our own time. The difference, however, is that whereas then the crisis heralded the emergence of the complicated as the dominant form of organisation (giving science its place in the world), the current crisis of delegation is heralding the emergence of the complex as the (coming-to-be) dominant form of organisation. With this emergence, of course, come the challenges of asymmetric leadership and asymmetric design.